October 14, 2007 at Malibu Creek State Park - This year's Fat Tire Fest and annual fundraiser is building up to be a great event! We've added moreactivities such as a hill climb time trial, a wheelie contest and demonstration, poker ride courses for all levels of riders and the log-pull contest. Bike manufacturers and shops will have bikes available to demo and the cache of prizes is building up for our famous raffle. There will be great food too so come on out and have a great ride, enjoy the festivities and support local mountain bike trail access. Pre-register now. CORBA announces a special program for our members in which we now can purchase one of the most advanced lines of sports drinks, energy gels and recovery drinks and receive a 30% discount on all purchases. You may be familiar with the Accelerade, Accel Gel and Endurox R4 brands. These products are unique in that they contain a patented 4:1 ratio (4 grams carbohydrate to 1 gram protein). This ratio has been shown to provide significant benefits to endurance athletes including extended endurance, faster muscle recovery, reduced muscle soreness and better rehydration. To purchase with the CORBA discount go to http://www.accelsport.com/corba Receive a 30% discount and pay a flat rate of $5.99 for shipping regardless of size. Limited time offer - get a FREE WATER BOTTLE for the next 30 days. 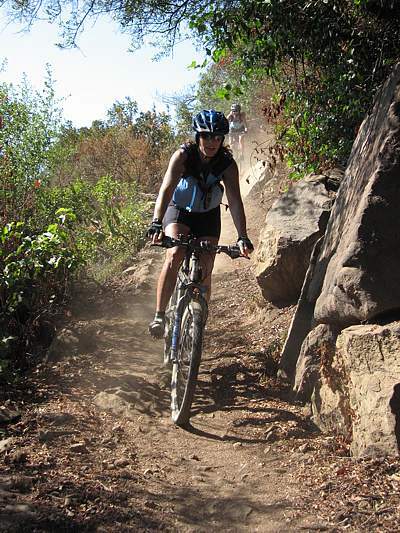 Saturday September 1, 8:45AM - The first Saturday of each month Mark Langton teaches mountain biking skills and back-country preparedness at Malibu Creek State Park. Admission is free and it is a great program for all levels of riders. For more information, visit our Skills Class page.